Pope Francis received Salvadoran President Mauricio Funes in a private audience in which they discussed Archbishop Oscar A. Romero’s canonization cause. 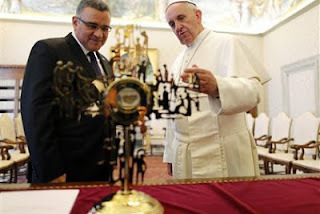 The Salvadoran president gave the Pope a reliquary containing a piece of garment that Msgr. Romero was wearing when he was assassinated. At the center of the garment, clearly visible, is a bloodstain. The reliquary monstrance is in the shape of a cross, with the arms depicting stylized human figures, representing the participation of the people of God in the death of his bishop. The case is the work of the Sisters of Divine Providence Hospital in the chapel where Romero was killed. The President pointed out among other things that he was a pupil of the Salvadoran Jesuit Father Rutilio Grande, who was killed three years before Romero, who then drew inspiration from his example. El Salvador’s ambassador to the Holy See, Manuel Lopez, told The Associated Press yesterday that when he met Francis, the Pope told him, ‘‘I hope that under this pontificate we can beatify [Romero].’’ The Vatican spokesman, the Rev. Federico Lombardi, confirmed that Francis is indeed very much in favor of the slain archbishop's sainthood case.Eight years earlier, Pope Benedict XVI received El Salvador’s then-president Elias Antonio Saca, in June 2005 and the two had discussed the status of Romero’s canonization cause. Mr. Saca had served as an altar boy for Archbishop Romero. In July 2007, Mr. Saca’s government publicly petitioned the Vatican to canonize Romero, in an effort to settle complaints about the lack of an official investigation of the crime. Mr. Funes was elected to succeed Mr. Saca as a candidate of the leftwing FMLN, the former guerrillas who squared off against rightwing forces and a military dictatorship that ruled El Salvador through the early 1980s. When Mr. Funes came to office, he vowed to make Romero his moral reference point and has declared Romero as the “spiritual guide of El Salvador.” On the 30th anniversary of Romero's death, Funes acknowledged state participation in the assassination and asked forgiveness for it. This is wonderful news. How great it would be if the Church beatified both Archbishop Romero and Fr. Rutilio Grande, S.J. together, because they were so together in life. A Benedictine missionary in El Salvador for 8 years, Fr. Kevin Murphy, O.S.B. would love and pray that this happens...God willing!